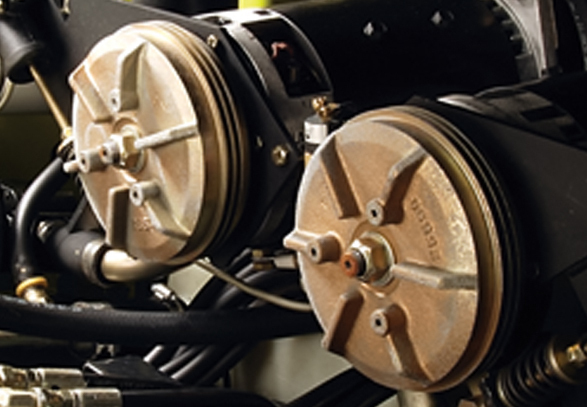 CLARK has partnered with some of the best suppliers of remanufactured parts in the business. You can be assured that you will be receiving quality parts at the best price. All of our parts are covered by our Industry leading warranties which back up our commitment to quality. We have programs on: Engines, Transmissions, Torque Converters, Cylinder Heads, Overhaul Kits, Electric Motors, Hydraulics, Steer Gears and Steer Axles. All welded torque converters are completely cut open, chemically cleaned, and inspected for internal damage. Wear items such as hubs, bearings, sprag clutches, and thrust washers are always discarded and replaced. All new spring clutches, bearings, races and thrust washers are installed to restore unit to the proper internal clearances. Converters are welded together using state of the art automated equipment to insure weld integrity and unit concentricity. After welding, converters are plugged, pressurized with air to 100 PSI, and submerged in water to test for leaks. Converters are computer balanced to within 5 grams or less and dial indicated to verify that runout is maintained within specifications. Remanufactured converters are electrostatically painted with a special heat sensitive paint. The finished assembly is packaged in a specially reinforced heavy-duty carton to protect it during shipping. All Joseph Industries Remanufactured torque converters carry a 6 month/1000 hour limited warranty. All transmission cores are completely disassembled right down to the last nut or bolt and cleaned in an industrial pressure washing machine. All “wear items” such as bearings, seals, sealing rings, clutches, separator plates, springs, and thrust washers are automatically discarded and are always replaced. All Remanufactured transmission assemblies are fully hot run tested up to normal operating temperatures. All transmissions carry a 6 month/1000 hour limited warranty. All engines are remanufactured by AERA (Automotive Engine Rebuilders Association) Certified mechanics according to the standards established by the AERA. Engines are completely disassembled, cleaned and inspected. Castings are tested for cracks. Remanufactured engines are backed with the industry leading 1 year/1000 hour limited warranty with a liberal parts and labor allowance. All repairs are done to original OEM specs, so if you ever need to buy repair parts for one of our steer axles, the OEM parts will fit. Axles with steer cylinders; all cylinders are honed and repacked. All rods are rechromed as required or replaced. Large inventory of reman axles in stock for both domestic and import lift trucks. Minimal lead time required for steer axles built to order 3-4 days.